Welcome to the 4th edition of our information bulletin, FYI (For Your Information). We are sharing local information to help improve outcomes for children and young people, whether they may be events flyers, programmes, opportunities or training. 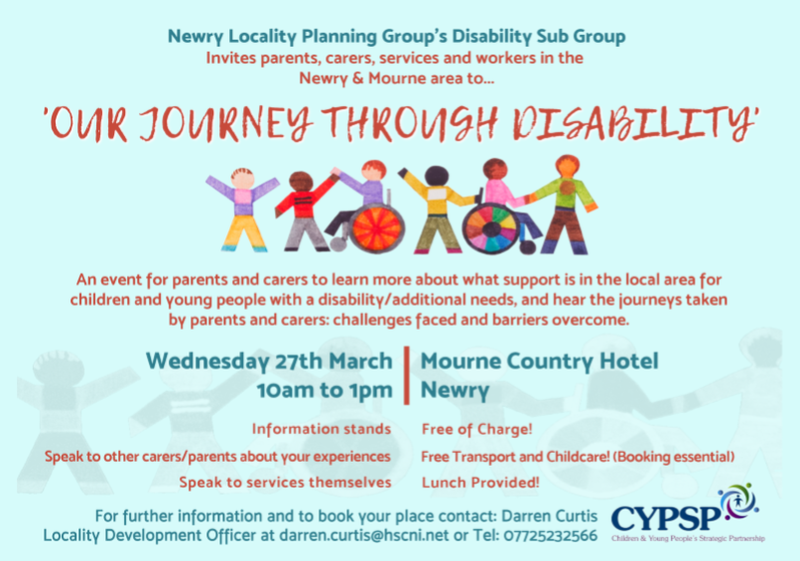 The Newry Locality Planning Group are holding an event for parents, carers, services and workers in the Newry and Mourne area to learn more about what support is available for children and young people with a disability/additional needs. For further information or to book a place please contact Darren Curtis at darren.curtis@hscni.net or 07725232566. Please find attached, Issue 2 of the recently launched Southern Area LPG Members Newsletter. Our aim is to share local information which can improve outcomes for children and young people, whether they may be events flyers, programmes, opportunities or training. These are collated and shared through the LPGs as part of the CYPSP. You are welcome to advertise through us free of charge. Welcome to our new way of sharing information on the great work of services and organisations aiming to improve outcomes for children,young people and families in the Southern HSC Trust Area. These newsletters are collated and shared through the Locality Planning Groups (LPGs) as part of the Children & Young People’s Strategic Partnership (CYPSP). One of our key functions is to share information given to us by both LPG members and others which aim to improve your contacts,participation, engagement and connections in the area.This is a great way for you to advertise events, opportunities,programmes and initiatives. Please send us your relevant flyers,announcements and information, which we will share with around 600 contacts in the area. We aim to send these, by e-mail, on alternate Thursday afternoons.